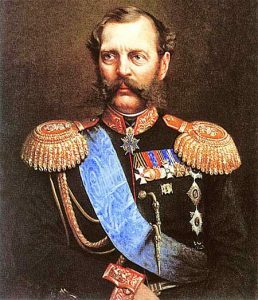 Emperor Alexander II, son of Emperor Nicholas I and his wife Alexandra Feodorovna, was born on April 17, 1818, joined the throne on February 19, 1855, at the height of the Crimean War. The fall of Sevastopol on August 27, 1855 put an end to this struggle, and on February 18, 1856, the Paris Peace was concluded, along which the Danube estates crossed Turkey. The Black Sea is declared neutral and open to merchant ships of all nations. The main event was the publication of the Highest Manifesto, February 19, 1861, on the release of peasants from serfdom. More than 20 million serfs were recognized as free. For such a blessing, the people called the emperor “Liberator”. Simultaneously with the manifesto, the “Provisions on the way of life of the landlord peasants with their land allotted” were published. September 29, 1862 approved the general principles of judicial reform, a public and oral court with the participation of local inhabitants. 1863 year. Abolition of corporal punishment and stigmatization of criminals. Publication of university statutes. Universities are open in Odessa and Warsaw. In 1864, drafted by a special commission and reviewed by the State Council, the judicial statutes were approved by the sovereign. The Russian people were given a new court – a vowel and a speedy court, right, merciful and equal for all. In 1870, the city’s position was introduced, on the basis of which the vowels of choice are the city duma, chaired by the mayor. In 1874 the Supreme Manifesto on universal military service was promulgated. obligatory for all estates from the peasant to the nobleman. Then many other important things were done, more than 25,000 versts of railways were made, private banks were established, public schools were opened. In 1862 a monument to the millennium of Russia was erected. In the spring of 1865, the final conquest of the Caucasus took place. In 1865, Turkestan was conquered by Verevkin, and Tashkent by Chernyayev. In 1876, all the Kokand Khanate was annexed to Russia. Bukhara emir was also defeated and yielded to Russia Samarkand. From these conquered lands, the Turkestan Governor General was formed with the main city of Tashkent. In 1873 the Khanate Khanate was conquered by General Kaufman. In 1881, Skobelev took the fortress of Geok-Tepe and forced the Tekeans to accept Russian citizenship. From 1877 to 1878, the Russo-Turkish Liberation War. On April 12, Alexander II announced to Turkey a war to liberate the Slavs of the Balkan Peninsula from the oppression of Turkish rule. The Turks, defeated at all points, retreated to Constantinople. On February 19, 1878, in San Stefano, a preliminary peace was concluded with Turkey, according to which Russia received part of Armenia with the fortresses of Kars, Batum, part of Bessarabia, the Bulgarian principality was established, and the independence of Serbia and Montenegro was recognized. But the Berlin Congress changed the San Stefan treaty to the disadvantage of Russia and in favor of Austria and Turkey. The end of Alexander II’s reign was overshadowed by numerous attempts on his life by an organized secret social and revolutionary society. March 1, 1881 Alexander II was killed by a bursting shell on the Catherine’s canal in St. Petersburg. On the site of the killing a magnificent church of the Resurrection of Christ was built.